What if Superman was Mediocre Man? 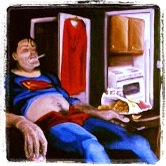 What if Superman wasn’t super at all. What if Clark Kent’s alter super identity was Mediocre man? Would he do everything with merely half the effort? I bet he’d only be able to partially see your grundies with his middle of the road x-ray vision. He’d probably be only sort of strong and able to leap a model building in a single bound; and I guess he’d be faster than an average jogger. I bet Lois Lane would totally ignore him and make fun of him, like, Batman is way cooler than you and he gets all the chicks; and rub it in that she’s dating Bruce Wayne. Mediocre Man would probably only make page 5 of The Daily Planet for accidentally setting his house on fire from dropping a cigarette while falling asleep. He’d probably get fired from his job as a reporter at The Daily Planet for lazy reporting. Also, he would probably flip off his enemies in frustration that he’s unable to beat them up; and I bet he’d drink tons of beer and watch reality TV like hoarders. Why would anyone even think up Mediocre Man? What a ridiculous super hero.